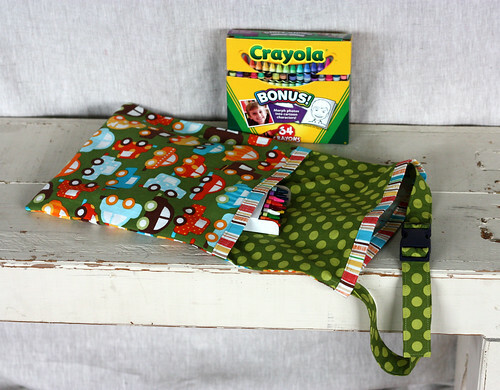 Welcome to Week 17 of the One Yard Wonders Sew Along! Carrie, taking a page from Diana’s book, selected 3 fabrics. 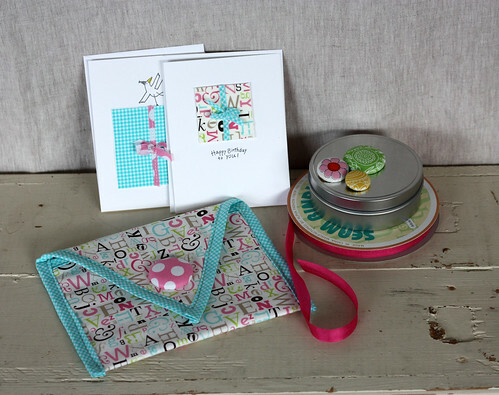 Timeless Treasures Allover Letters Neutral, Michael Miller Fabrics Ta Dot Candy, and Michael Miller Fabrics Tiny Gingham Aqua. Simple to follow pattern and fun to make. Carrie made her own bias binding and used fusible fleece in place of cotton batting. 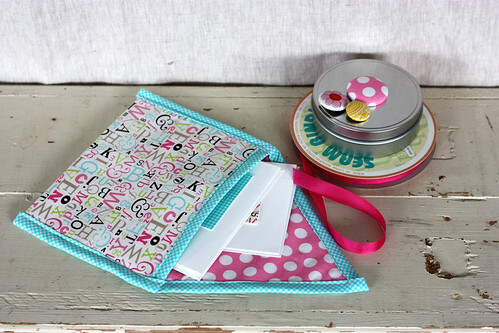 She is going to use the Planner Sleeve to give a gift of handmade cards. Other possibilities include recipes, photos, kids drawings, sewing notions to name a few. This pattern would be easy to re-size and re-purpose. Create envelopes of any size by keeping your over all measurement divisible by 3. How about a cover for a Nook or I Pad? Make it tiny and use for gift cards. A food friendly lining and you have a reusable sandwich bag. The options are endless. 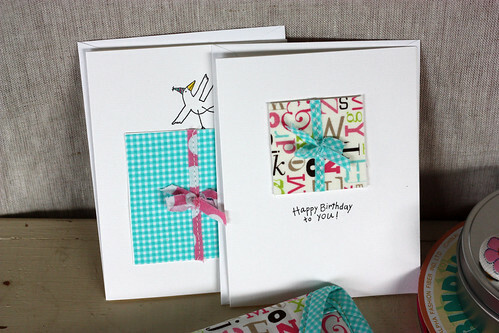 Wonder Under and rubber stamps make a great handmade card. Iron Wonder Under to your fabric, peal back and iron to card-stock, trim “package” to desired size. Stitch ribbon/bow on the package with your sewing machine. Attach to card with mounting tape. Rubber stamp your greeting and you have a beautiful card. Cindy chose 3 fabrics. 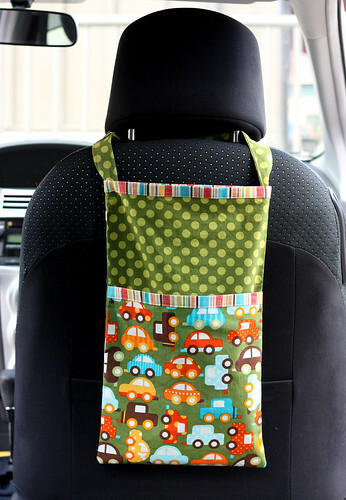 Ann Kelle Ready Set Go Cars Lime ORGANIC , Carolyn Gavin Spring Street Stripe Orange and Michael Miller Basics Ta Dot Moss. The pattern was fast, easy to follow and understand. A “one hour” project. Good for beginners. Cindy didn’t make any changes. She made the bag to go in her daughters car for her boys. 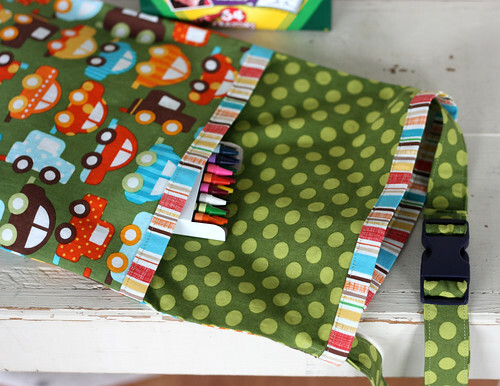 Cindy said this Not-Ugly Trash Bag is much too cute for trash….maybe toys, coloring books and pencils, or diapers & wipes for the baby would be a great use for this fun project.